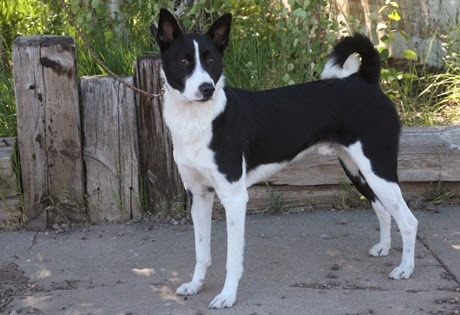 The Canaan dog is a natural breed of Israel that dates back to biblical times. The breed might be even older; there are drawings of dogs looking like this on tombs in the area dating back to 2,200 BC. It originated in the Land of Canaan and was the guard and herding dog of the ancient Israelites. After the Israelites were dispersed by the Romans over 2,000 years ago, the dogs avoided extinction in the Negev Desert. Some lived with the Bedouins and some were used as guard dogs for the Druze. Today there are somewhere between 2,000-3,000 Canaan dogs in the world. Most of them reside in Europe and North America. These dogs are territorial and can be reserved with strangers, but they are affectionate to their families. This is a working dog that needs exercise and activity to be happy. They are highly intelligent, easily trained, and require a minimum of grooming. They are also know to be healthy with an average life span of 12-15 years. They can be all sorts of colors, including solid black, tan, brown, sandy, red, white, and patterns with a symmetrical mask. Canaan dogs excel at dog agility trials, obedient, flyable, tracking, and herding. Allegedly, over 400 of the best dogs were recruited and trained as mine detectors during WWII, and they were very good at the task. Good looking dog. I personally believe that sometimes having a pet may help people in improving their lifestyles. Thank you for coming over! I agree completely. I think having a pet helps many people. How do I train my dog to use a pet door? Do dogs and humans have a common ancestor?